One of the scariest things that can happen to a doting pet parent is losing your beloved pet. You needn’t panic, though! There are a number of different precautions you can take to make sure if your pet goes missing, they can find their way home safely. Should they go astray, your pet has a much higher chance of being identified and returned if they have a microchip, ID tags and a collar. Over the last few weeks, we’ve talked about the logistics of moving house with dogs, birds and cats. 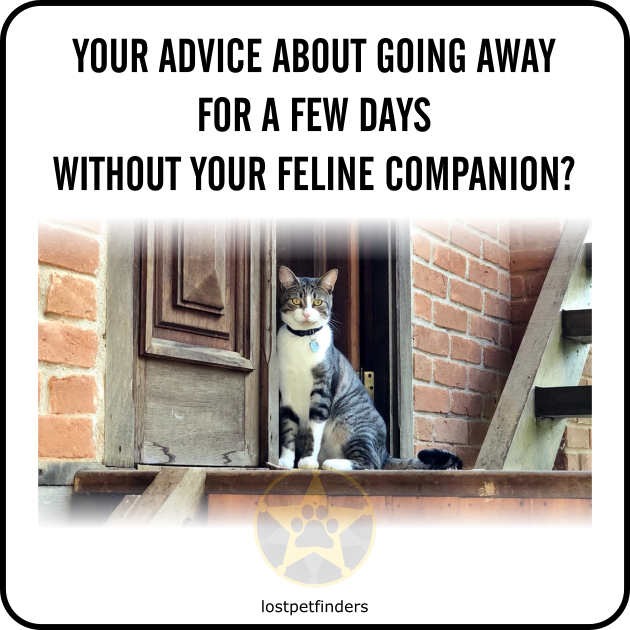 The Lost Pet Finders community have shared loads of great tips on how to make things go as smoothly as possible, but there’s always a chance that things will go wrong and your pet will go missing. Today, we’re going to talk about one of the ways you can deal with this eventuality: microchipping. NOTE: We recommend that you microchip your pet. The single greatest reason for microchips not being effective is incorrect contact details. So without further ado… what does the community have to say? MICROCHIPS WORK. Of course there are some exceptions to the rule, but the vast majority of commenters had positive experiences of microchipping to share. 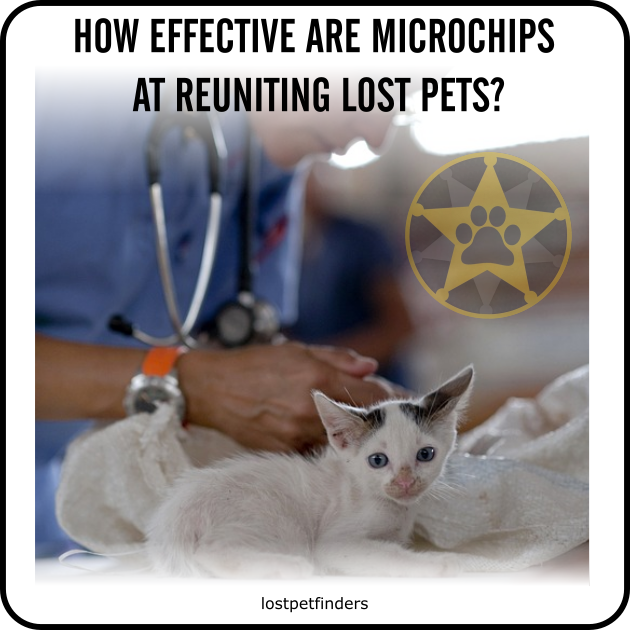 They found that their pets’ microchips gave them a real sense of security, and helped to reunite them with their lost pets when they went missing. KEEP YOUR MICROCHIP UP-TO-DATE. As fantastic as microchips are, they’re no use if they don’t store the right information. If you know your pet’s microchip number, the easiest way to change your information is to search it on www.petaddress.com.au. If you don’t know it, you can find it by contacting your vet. The website will then redirect you to the database listing your pet’s microchip number so that you can contact the company yourself. To make things easier, the websites of some pet registries have simple Change of Address forms you can use. GET CHECKED REGULARLY. Accidents happen: databases update, microchips fail, information is uploaded incorrectly. When your pet has their annual checkup, ask your vet to check their microchip is working as it should. Emma Darling (ACT) knows all too well how important this is: “At about 10 years old I was moving my cat interstate. I got my cat completely checked up, while I was there I asked they check her chip details. Turns out it was blank. Apparently, it all used to be snail mail or faxed in, they used to regularly lose chipping paperwork. So for like ten years my cat had blank chip details. MICROCHIPS CAN FAIL. Not every plan is foolproof, and microchips are subject to failure just like everything else. Some people feel that microchips give pet owners a false sense of security. THEY CAN BE TRICKY TO UPDATE. It makes sense that the most common cause of microchips not working is an owner’s failure to update them: a many of our community members found it difficult or even impossible to update their details. Microchipping as a process would definitely benefit from a simpler way of updating these details. Do you have any important tips that you feel we’ve left out here? Let us know in the comments below! Once again, we’d like to thank community members like Sue, Ian, Roxanne, Candace, Emma, Cassandra, Christine, Heather, Veronika and Maria, without whom this article would not have been possible. We’ve come to the end of our advice series on moving house with pets. 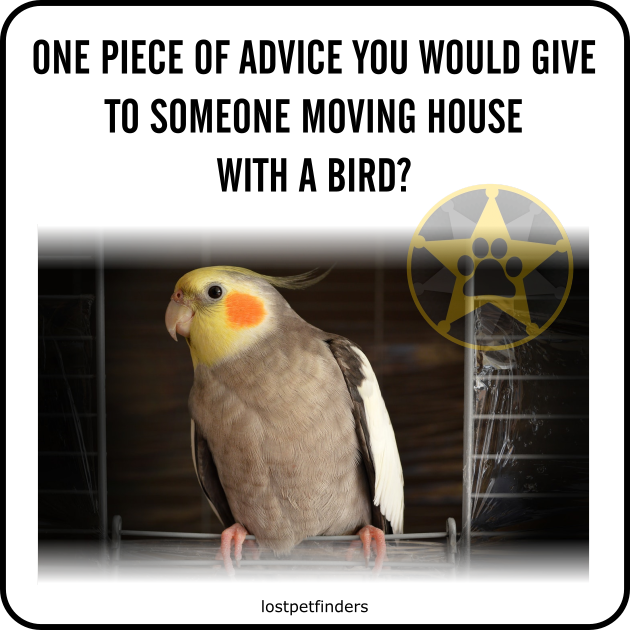 Over the last few weeks, we’ve been asking all of our community members a final question: What’s the one piece of advice you’d give someone moving house with a bird? We’ve already talked about the best tips for moving house with a dog, but a bird is obviously a very different animal. So what do we need to do? COVER THE CAGE. Chances are, your bird isn’t overly accustomed to spending time in moving vehicles. They already have wings, why would they need a car? Try to reduce stress by keeping their cage covered while in transit, so they don’t need to worry about why the world is moving by so quickly. KEEP IT LOCKED. Birds can be devilishly intelligent animals, and the last thing you need when you’re driving to your new home is a bird flying all over the car! Lock the cage to save yourself the drama. Jill Larche Large (NZ) adds: “Padlock the door and cover the cage… secure the cage with the seat belt” – that bird’s not going anywhere! INVEST IN A DECENT TRAVEL CAGE. Don’t attempt to shove your entire aviary in the car! This will just take up valuable packing space, and your bird will be just as safe and happy in a travel cage. Your bird’s travel cage should be both comfortable and secure, and you need to be able to rely on it not to let your bird escape. Most importantly of all, your bird needs to feel safe when inside, so they can travel without stress. It’s worth putting some thought into the type of travel cage you want to go for, as a decent one will last for your bird’s lifetime. Examples of good cages include the Pawhut Stainless Steel Travel Cage, Celltei Pak-o-Bird and A&E Cage Company Soft Sided Travel Carrier. COVER THE WINDOWS. Once you and your bird arrive in your new home, it may take them some time to get used to the new surroundings. The first few times you let your bird out in your new house, make sure all of the windows are closed and covered to prevent panics and escapes. 1. PLACE A LOCK ON YOUR BIRD CAGE OR AVIARY. PACK IN A DIFFERENT ROOM TO YOUR BIRD. If your bird sees you moving around all your stuff, chances are this will confuse and worry them. Add to this the loud and peculiar noises that moving house can entail, and it’s best to just leave them in peace! SET UP THEIR SPOT. Once you’ve established your bird’s new personal space – complete with their old cage, favourite snacks and toys – it’ll be much easier for them to get settled in. “my male tiel has always been a good traveller and good with visiting others. so all i had to do was setup his spot in the new house, while he was in his travel cage, and just popped him in his mansion." Recently, we asked our followers a question: What is the one piece of advice you’d give to someone going on a trip without their cat? We’ve already discussed how to go about massive moves with cats and dogs, but what if you’re only going somewhere for a few days? One thing we’ve learned is that everyone has their own little way of going about this. THE LIVE-IN PETSITTER. If you’re comfortable with letting someone else live in your house for a few days, finding a live-in petsitter is a great way of making sure your cat is cared for and doesn’t get lonely. THE CATTERY. If you can’t find anyone who’s able to stay in your house while you’re away, a cattery might be a good option for you. Your cat will have plenty of professionals on hand (er, paw) to cater for their needs, so you won’t be the only one going on holiday! Meegan’s personal recommendation is “Catshack” in Narre Warren, because “Nic and Simon have the perfect set up, highly recommended by myself and many others”. However, there are many other great catteries to choose from all over Australia and New Zealand. Jackie Wallis (TAS) adds: “Board at my Vets” – definitely something to consider if your local vet offers that service! THE VISITING PETSITTER. Catteries may not be for you, and that’s alright! 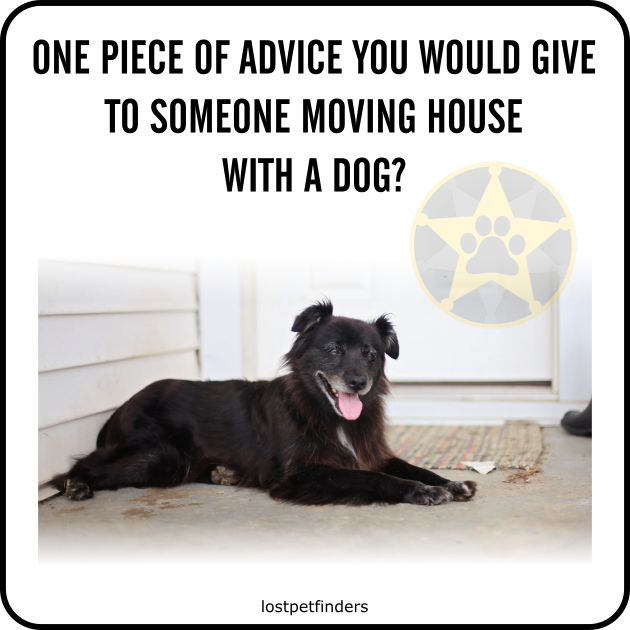 A visiting petsitter will also do a good job. Get a professional petsitter – or even just a friend or relative – to call in and visit your cat every now and then. GET ON FACETIME. An added bonus that comes with a live-in or visiting petsitter is that you can ask them to let you facetime your pet through their phone. If you’re in the market for some special tech, you could consider buying a pet camera like the Furbo, Pawbo+ or Petcube Bites. These gadgets also have great bonus features like two-way speakers, motion detection and treat dispensers. LEAVE YOUR CAT WITH EVERYTHING THEY NEED. Some cats are startlingly independent and need us a whole lot less than we might think. If you trust your cat to behave, eat the right amount and not mess up your house, try giving them the independence they obviously think they deserve. KEEP THEM SECURE. Whether you go for a petsitter, cattery or kitty independence, it’s important that you make sure your cat is somewhere safe while you’re away. After all, you won’t be there to know if they’re just on an adventure or they’ve gone missing entirely. Because what’s the point in going on holiday if you’re just going to worry all week? Giving your cat a healthy diet! Once again, we’d like to thank community members like Karen, Barb, Meegan, Jackie, Stephen, Pauline, Penelope, Maryann, Em and Nicole, without whom this article would not have been possible. Phobias are irrational, so it can be hard to understand why your dog is afraid of something and even harder to work out how to help with that fear. Over the last couple of months, we’ve discussed the most common fears a dog might experience, and how to deal with those fears. Our most recent phobia was the fear of cars, which can make it pretty difficult to go anywhere and do anything with your pup. We’ve finally come to the end of our fear list, but there are still other fears out there! If your dog has a fear we haven’t covered and you’d like more information on that phobia, don’t hesitate to get in touch. While we wait to hear from you, let’s talk about the last item on our list: dogs who are afraid of specific objects. Is your dog afraid of your vacuum cleaner? Do they run and hide or bark constantly when you bring out the halloween pumpkins? Do they get jumpy when you try to move the furniture in your house? These are telltale signs that your pooch has a phobia of certain items. Why Is My Dog Afraid? As we’ve already discussed, a dog can develop a phobia for any number of different reasons. With fears of specific objects, it often comes down to the dog being afraid of something they aren’t familiar with. A key example of this comes when you decorate for holidays, whether that’s Halloween, Christmas or someone’s birthday. Suddenly, there are flashing lights, balloons, shiny objects and sometimes even foliage. Your dog clearly doesn’t know what day of the year it is, or why you’re putting a random tree inside your house. Dogs can sometimes develop phobias as a result of negative experiences. For example, if you accidentally put a chair down on your dog’s paw or close their tail in the door, this can easily lead to a fear of these objects. It’s also pretty common for a dog to be afraid of objects that make strange and unpredictable noises. For example, some teddy bears have mechanisms inside them that cause them to play a song or make a laughing noise. This can be surprising and terrifying to a dog who as just about become accustomed to teddy bears as inanimate, silent objects. Your dog can develop a fear of this toy as a result, and that fear may even pass onto other stuffed toys. This can also be the reason for a dog’s fear of hair dryers, washing machines and other loud household appliances. Between birth and adolescence, many dogs experience two different “fear periods”. These periods are temporary, but can result in permanent phobias if dealt with incorrectly. At these points, a dog will often begin exhibiting a fear of objects, people or situations they were previously comfortable with. For example, they may suddenly start acting shy around new people, or begin to growl at the sofa. The first fear period is the “fear impact period” where your puppy is beginning to learn about the difference between dangerous and safe things, and this generally takes place between the ages of eight and twelve weeks. At this time, your dog is trying to make sense of the weird world that surrounds them, so every person and item needs to be re-evaluated. Encouraging planned socialisation with people and other dogs. The kindest and simplest way to help your dog through their fear of random objects is to help them see the item as a good thing instead of a scary one. This is called desensitizing. This is the same technique used to help dogs afraid of loud noises. Take, for example, a dog who is afraid of fast food wrappers. Begin by gathering a very generous amount of small, tasty treats that are easy for your dog to swallow. Things like chunks of cheese, hotdogs, cold cuts or leftover roast are perfect. Just make sure that whatever you choose, it isn’t likely to upset your dog’s tummy. Avoid weight issues by counting the treats you use as part of your dog’s meal. They won’t mind! Begin by placing the fast food wrapper far enough away that your dog is not yet reacting to it. Begin throwing treats in the direction of the wrapper, so that they create a trail your dog will slowly follow closer to the item. If your dog starts getting nervous, slow your progress by throwing the treats at shorter intervals. Try to give your dog a training “break” every now and then. For instance, if you began 20 feet from the wrapper and have managed to work up to 10 feet from the wrapper, toss a few treats at the 15-foot mark to let your dog relax. It may seem counterintuitive, but taking these breaks can really speed up the process. Only carry out this training for about 5 minutes at a time, making sure to always finish in high spirits. You can do this once per day, or even several times each day. Just make sure your dog always has at least 5 minutes to rest between each session. Once your dog is happy to take treats right next to the wrapper, try moving it a little bit with your foot while dropping lots of treats at once.